- The other 6/8 players will be doing a technical session on the outside of the grid. Description: Players are in 2 teams. The blues have a 3 in a defensive bank and are matched against 1 centre forward. The reds have 1 centre forward, and 3 players in a channell to rebuild play. The recycling players can carry the ball into the 3v1 grid to create a 3v2. 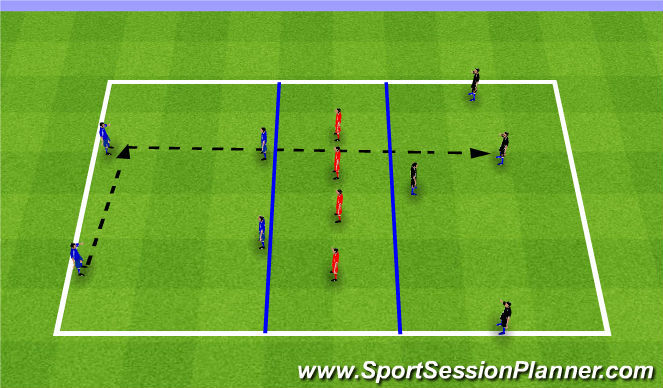 When the ball is in the shaded 3v1 grid its open play, players can be tackled etc. 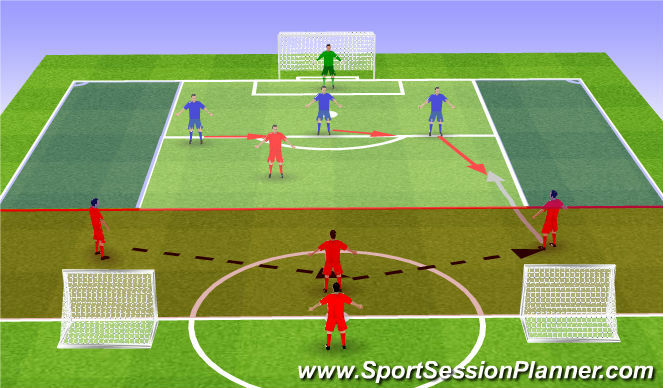 The objective is for the reds to score on the goalkeeper and the blues to get blocks and score in the 2 small goals quickly. 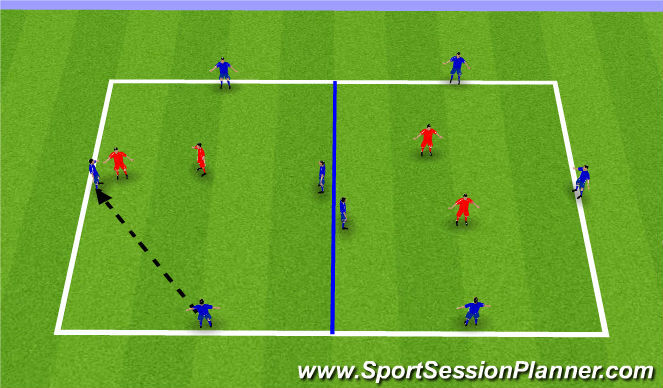 A blue player can decide to dribble into the 3v0 channell and score, if thats the case one of the 2 recycling reds can tackle. 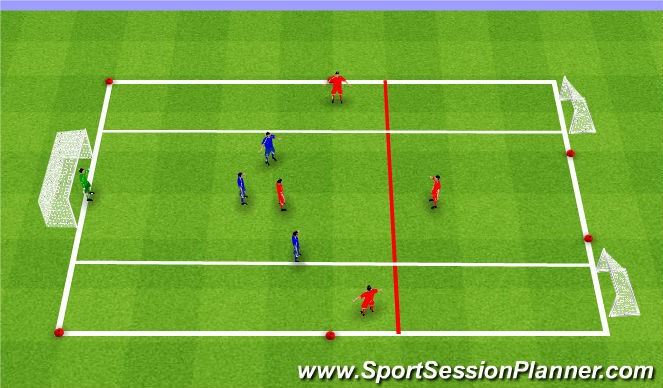 The 2 red players on the end line distribute footballs into the game and switch with the recycling reds every 3 mins. 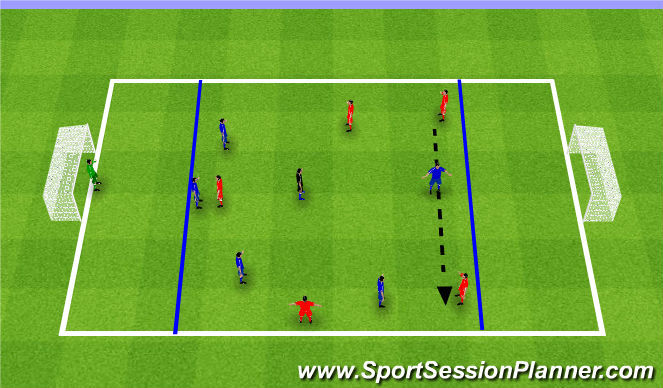 4) Transition to Defend - if its 2v3 when a blue breaks, can we delay and get a block. Description: Players are in 3 teams of 3 or 4. Looking to slide and screen to prevent penetration. The objective of the game is for the 2 teams to pass between eachother and the team in the middle to get a block on the pass. Progression 1 - One defender can press, how do the teammates slide ad prevent exposure. Description: 2 lines of discs represent engagement for both sides, emphasis on dropping deep to set traps rather than first engaging high. Players can set the same traps but deeper. When this is coached for 15 mins, players will be left free to play.